We previously wrote about the disastrous House version of the 2018 Farm Bill, here, which was passed along party lines earlier last month. Subsequently, the Senate has displayed a refreshing sense of bipartisan value, passing a Farm Bill that benefits farmers, the environment, and low-income Americans. The Senate Farm Bill stands apart from the House version with a clear statement in support of feeding low-income Americans. The bill protects and strengthens the Supplemental Nutrition Assistance Program (SNAP) without making drastic cuts to eligibility. The Senate version also seeks to increase participation for seniors and disabled persons and improve access through updates to the Electronic Benefit Transfer system that allows SNAP to be used at grocery stores and farmers’ markets. 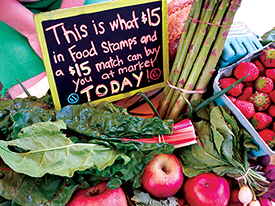 The Food Insecurity Nutrition Incentives (FINI) program increases affordability of fruits and vegetables for SNAP shoppers. The Senate bill bumps up funding for FINI to $50 million per year, and offers stability by giving the program mandatory funding in the federal budget. The FINI program was created with a large effort from the late Gus Schumacher, founder of Wholesome Wave. Both the Senate and House bills name the program in his honor. The Senate bill creates the Local Agriculture Market Program (LAMP), which covers existing value-added producer grants (like supporting a tomato farmer to make canned sauce) and direct-marketing programs (think farmers’ market promotions). LAMP streamlines these programs, making it easier for farmers and nonprofits to access resources for developing and promoting local agricultural products. The bill increased the funding for local food systems, making $60 million per year available in mandatory funding. The Senate bill provides mandatory funding of $25 million to the Outreach and Assistance for Socially Disadvantaged and Veteran Farmers and Ranchers program (the 2501 program), which seeks to level the playing field for historically underserved producers. The program and its impact are strengthened by new changes, including adding authorization for multi-year grants, and a peer review grant process. Introducing a healthy soils program, supporting cover-crop planting, and mandating data collection on conservation and crop yield are some of the ways the Senate bill protects our environment and conserves farmland for future generations. Unlike the House version of the farm bill, the Senate bill renews funding for the National Organic Certification Cost Share Program which supports farmers with organic certification. Additionally, the Senate more than doubled the funding available for the Organic Agriculture Research and Extension Initiative (OREI), which supports research projects to address the most critical challenges faced by organic farmers. The Senate and House have passed significantly different Farm Bills. To move forward the leaders of both houses, plus senior agriculture committee members, will need to work together in a process called “conference” to negotiate the versions into one Farm Bill. This final version will need to pass both the Senate and House before being sent to the President for signing into law. With the summer recess fast approaching, Congress has few working days to finish the job. And in an election year, it’s even less likely for such a large budget bill ($867 billion!) to be passed ahead of the September 30 deadline. If a new Farm Bill is not passed by this deadline, the policy would revert to the original 1949 law (which would be a financial disaster). Much more likely, Congress will pass an extension of the existing policy and funding levels, essentially kicking the deadline down the road. This happened a number of times during the 2012 Farm Bill reauthorization, which was finally complete in 2013. While extensions help prevent farm & food disaster, it doesn’t help the programs that currently don’t have mandatory funding – any program that is subject to the budget process would cease to operate during the extension period (this includes FINI, the programs included in LAMP.) So, it’s still very important to pass a Farm Bill reauthorization and update the programs to meet the needs of farmers, rural communities, and eaters (aka everyone!). Stay tuned for updates on the conference process. We’ll share again when a final combined bill has been proposed. This entry was posted in Blog, Featured, Food and Farming News and tagged beginning farmers, CalFresh, equity, farm bill, food policy, organic food, SNAP by Ecology Center. Bookmark the permalink.